We’ve added a new page on Transas City to highlight a very small part of the history and accomplishments of Joanna Clark, who we interviewed on Trans Talk in November 2017. Ms. Clark is in some ways the founder of the current fight for transgender military service, and she was a major activist in the fight against HIV/AIDS in the 1990’s. On her page you can listen to a 1-hour interview we had with Ms. Clark, see a couple of old photographs of her (including a high-resolution scan of one I bought recently), and read a newspaper article from 1977 about her fight for recognition and equality. This entry was posted in History, Military and tagged joanna clark on February 5, 2018 by . On this month’s Trans Talk Edition of the Tenth Voice we’re going to have a special interview with a woman who is part of living transgender history. You’ve heard all about the issue of transgender troops in the military, well our guest, Joanna Clark, is the grandmother of that issue. 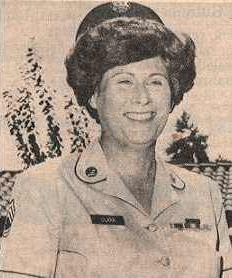 After a long career in the Navy she was ousted from the service in the 70’s and then enlisted in the Army as an openly transgender woman in 1976. She was discharged again and took on the military, suing and winning in court. She went on to fight for transgender rights in the 70’s and 80’s, being instrumental in the fight to change gender markers on birth certificates and drivers licenses in California. She then started and ran the AEGIS online bulletin board, which became the largest HIV/AIDS information database in the world, for which she was nominated for the Nobel Peace Prize. We will have a new take on the transgender news of the month, and we will finish up the show with the community calendar update. I do hope you will be able to join me this Saturday, November 25th at 1:00 pm on 90.1 KKFI, Kansas City Community Radio! You can also stream the program live on kkfi.org, or via various apps on your phone. This entry was posted in Activism, Education, History, Legal, Medicine, Military and tagged aids, joanna clark, kkfi, military, trans talk on November 22, 2017 by .